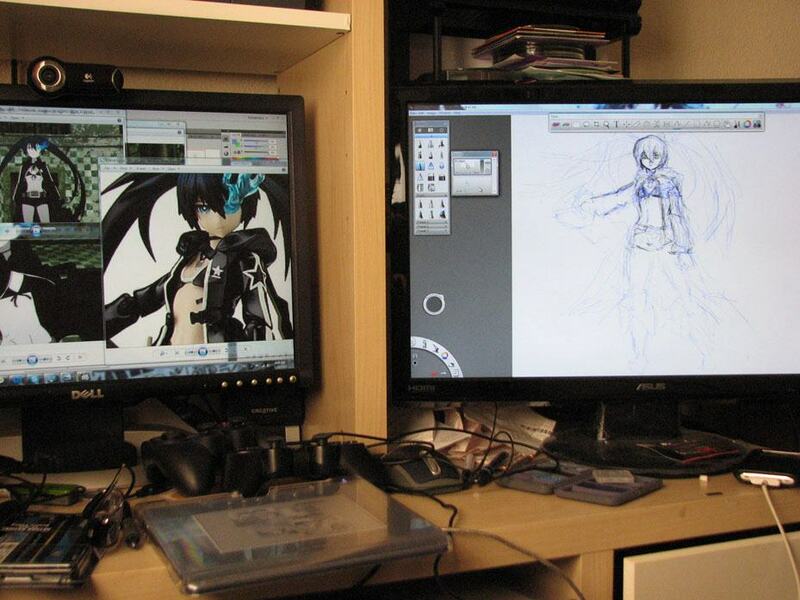 I’m currently working on a digital work of Black Rock Shooter. I’m trying to base her off the anime version so the design is a bit different and there aren’t too many references out there other than taking stills from the episodes. I’m probably having the hardest time doing her Rock Cannon compared to everything else. I’m currently in the coloring phase so I guess I’m almost done. Just like all my previous works, I’ll do a full post on the process once I’m done. I really would like to get a new tablet because working with just a 4×5 area is pretty difficult. I mean it works, but the features on the newer tablets are very attractive. I got a PSP recently and I’ve been enjoying it. If you consider December recent, I guess you could include the PS3 as well. I’m pretty happy because I finally get to enjoy some titles that I’ve been missing out on. I’m also enjoying a few imports. 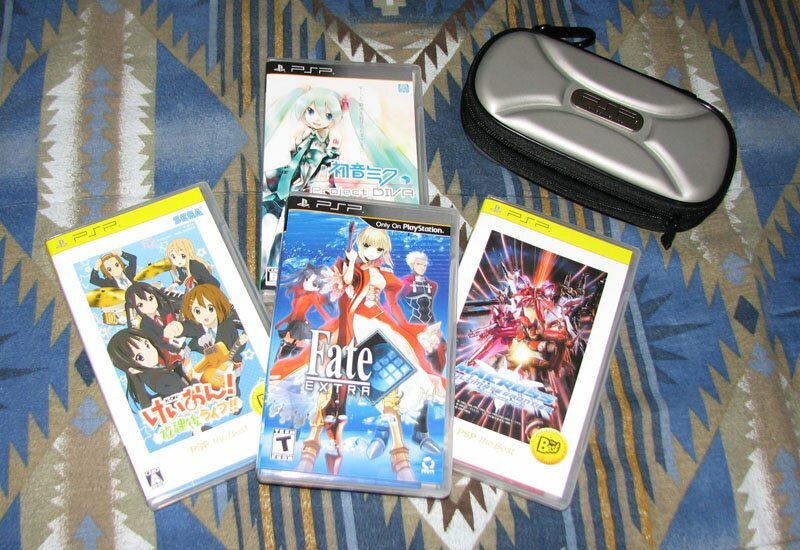 Project DIVA, K-ON Houkago Live, and Macross Ultimate Frontier have been on rotation in my PSP. I’ve been out of rhythm games for a while, so it took some getting used to with regards to those. Diva was just a matter of learning the songs. I enjoy the soundtrack quite a bit, and have some of Miku’s songs on my iPhone now. I’m pretty sure I’ll be picking up the sequels within the next few paychecks, depending how that pans out. With K-ON, I did have previous knowledge of the songs since I was such a big fan of the show, but I’m having a hard time reading the lines since you have to shift your eyes back to the left for the next stanza. That’s probably my biggest gripe with it. Macross I haven’t delved into too much since it requires a bit of research on the menus, controls, and gameplay. Once I take care of that, I’m sure I’ll have fun with it. My next target for PS3 importing would probably be the Macross Frontier BD with the PS3 game. I’ve been curious about how that plays and have been dying for a Macross game on console. 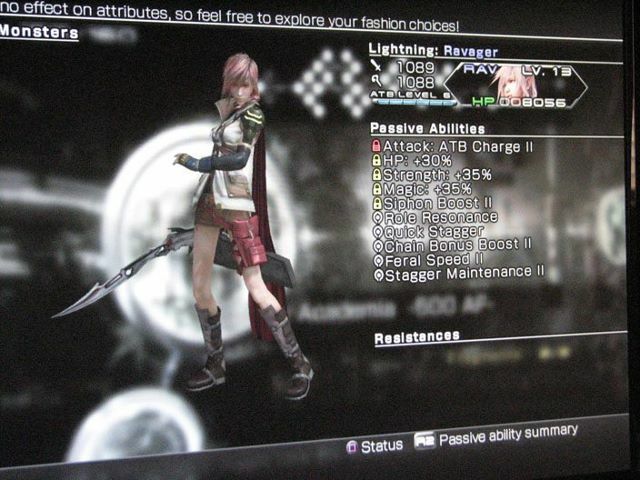 Finished Final Fantasy XIII-2 and I have to say I was relatively pleased with the game. It really didn’t take too much grinding to max out which I likee because I honestly don’t have as much time to dedicate to gaming as I used to. I did the full 160/160 fragments, maxed the Crystarium, and captured and maxed Lightning within 50-60 hours of game time. My save says 70+ but I left my PS3 on a good number of times because of being stuck on those paradox anomalies. I am missing a few trophies, but I guess I can get back to that eventually for the Platinum status. I’m not in any rush though. Whether this is a spoiler or not, I have to say that I was quite surprised that it said “To Be Continued…” at the end. Also been enjoying Dead Island with a few of my buddies. One thing I’ve been missing is some good coop games. I must say I’m enjoying the multiplayer experience with this title, and once we’re done I’ll definitely be looking for the next. Any recommendations, go ahead and shoot. Any genre pretty much, except sports. 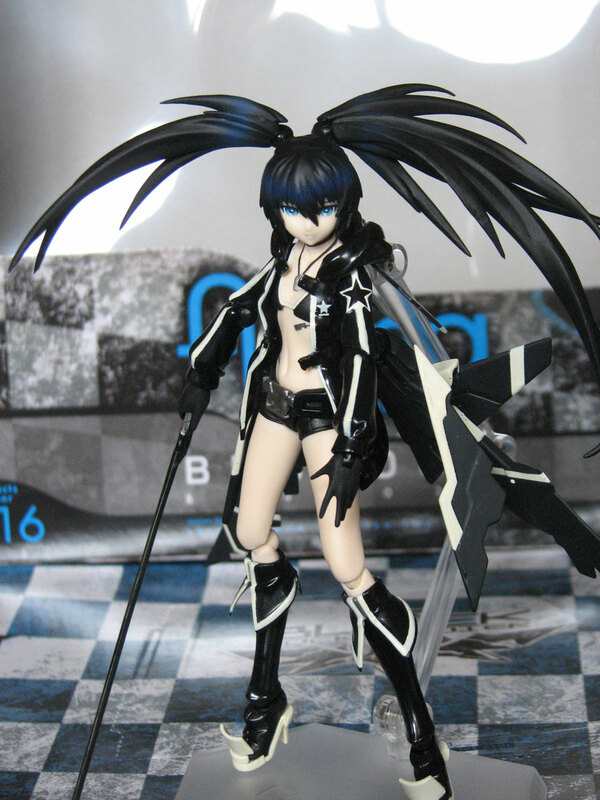 I picked up my first figma, the Max Factory BRS2035 Black Rock Shooter: THE GAME version. I like the figure, but I think I’d like to get a BRS without the wings. If they release an TV anime version of her, I’ll probably preorder it on the spot if the sculpt is good. I’m really really tempted to get a Hatsune Miku though. Debating if I should get the Good Smile Vocaloid 01 PVC rerun or a nendroid of her though. I would also like a Yozora from Boku wa Tomodachi simply because I like the character. As for anime and manga, I’m watching pretty much a little of everything as usual, but I guess I’m following BRS and Persona 4. For people who played the game, Persona 4 does pretty well at fanservice, even throwing in some Persona 3 references. This BRS seems a lot darker than the anime version with regards to the relationships of the characters. I actually dipped into my first Light Novel recently, “The Melancholy of Haruhi Suzumiya.” Having watched the anime, I figured I might as well check it out, and it was pretty much what I expected. Even though I already knew the story, it was still an enjoyable read. I think that they did a great job in the anime adaptation. It made me want to actually watch it again afterwards. I did get a bit more of a feel for Kyon’s character in the text form, but I felt that his VA did an excellent job for that role. On this front, I’m aiming to pickup the “Huke Selected Works – BLK” artbook as well as the Kimi ni Todoke volume 2 BD/DVD combo pack. Manga wise, I’ll probably just pick up another volume 1 of whatever series I stumble across. Musically, I’ve been hooked on this J-Rock group, Prague. Maybe it’s just my opinion, but I do appreciate how J-Rock seems to be more complex musically compared to the alternative music I normally listen to locally. I think J-Rock takes some roots from jazz or something… I really enjoy listening to the bass lines. I have been trying to improve my bass skills by listening and playing along with J-Rock. I don’t have an acoustic guitar around the house anymore, so there goes any chance of doing future covers. I have been wanting to do some vocal covers of a few songs like “High, High, High” from Usagi Drop but that’s dependent on me picking up a mic for recording. Anyway, that’s pretty much it. Tons of stuff on my want list but things will come in due time. I’m in no rush at all. I’ve been pretty complacent with how things have been recently. Just crossing my fingers for my job situation to go full time status. We’ll see how that goes. Hi Uncle Matthew! We like your drawings and music! We look at at them a lot. Is the death devil people really from K-ON or did you make it up? ( we just wanted to know) Did you like the rainbow cake we made? Those old videos of you singing are cool. Maybe you could draw Hatsune Miku and post it.Maybe also Shugo Chara. You could also try to draw people from Final Fantasy. You have a lot of Japanese things like movies,games, and figures. 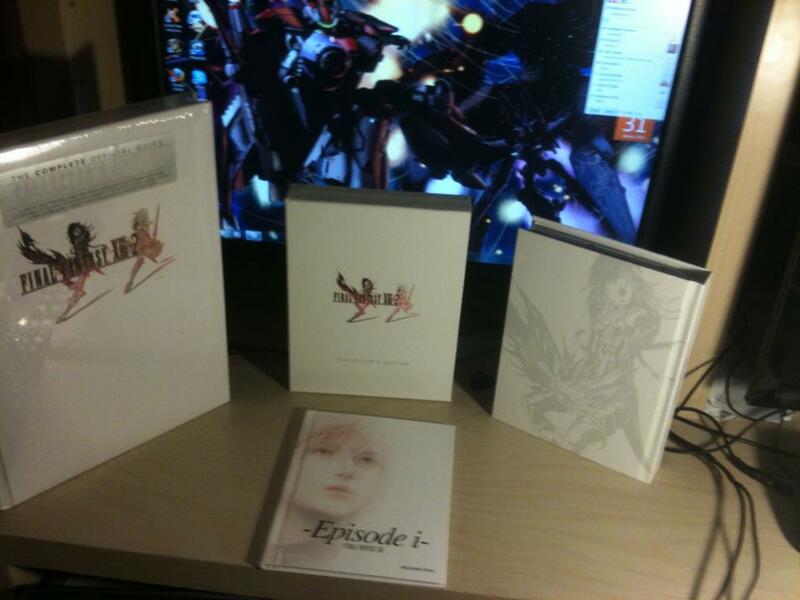 Do you think we can borrow Final Fantasy XIII-2 from you? We just borrow it from the library but we only have 4 weeks to finish it. We have our own blog too, can you add us to your circle(if you have a circle). If we’re already in there that’s fine. If don’t go on your blog often then this might be late. Bye!!!!!!!!!!!!!!!! November 17, 2012. ^_^ T_T XP.